Wife of Dr. Mohammad Ilyas Lohani, Medical Officer. Father of Dr. Javed Umar Khokhar, Demonstrator, Anatomy Department. All the staff of Sheikh Zayed Medical College and Hospital participated in the Condolence Meeting. In the end Doua was offered, “May Allah bestows the best of Jannah upon departed souls and provides Sabar-e-Jamil his family members to bear this eternal loss”. 26TH OCTOBER , 2011 WORKSHOP ON CRITICAL THINKING AND BLENDED LEARNING Click here to View Pictures of this Event. A workshop on “Critical Thinking and Blended Learning” conducted by team of University of Liverpool (UoL), United Kingdom, consisting of Prof. Janet Strivens, and Prof. Dr. Ian Willis, Center of Life Long Learning, UoL, UK, in collaboration of University of Health Sciences, Lahore Punjab, on 25-10-2011, at Sheikh Zayed Medical College/Hospital, Rahim Yar Khan. Prof. Dr. Muhammad Saeed, Principal, SZMC/H, R.Y.Khan, briefed the honourable delegates and participants of workshop about the working/functioning and services provided by Sheikh Zayed Medical College/Hospital, R.Y.Khan. Senior faculty members and consultants of SZMC/H, R.Y.Khan attendant the workshop. 1ST OCTOBER , 2011 TRAINING WORKSHOP/SEMINAR ON “DENGUE FEVER” Click here to View Pictures of this Event. A Training Workshop on “Dengue fever” was held in the auditorium of Sheikh Zayed Medical College Rahim Yar Khan on 1st October, 2011, under Chairmanship of Professor Dr. Muhammad Saeed Principal Sheikh Zayed Medical College/Hospital Rahim Yar Khan. A large no. of academic staff, consultant, Doctors, Nurses and Para Medical staff attended this seminar. Dr. Muhammad Sharif Akhtar, Assistant Prof. Community Medicine, Dr. Abdul Rahman Professor Pathology, Dr. Abdul Razaq Malik, Assistant Prof. Community Medicine ,Dr. Abdul Waheed, Assistant Prof. Medicine addressed to the participants in the seminar & highlighted its magnitude, the world over & in Pakistan clinical presentation, laboratory diagnosis, preventive & control measures regarding Dengue fever. Professor Dr. Muhammad Saeed Principal SZMC/H, while speaking in the seminar, said that treatment facilities of Dengue fever are available in this hospital, free of cost. He further added that SZMC/H also launched special campaign to create awareness among general public in District Rahim Yar Khan. 1ST OCTOBER , 2011 INAUGURATION OF MOTOR CYCLE PARKING FOR SZMC EMPLOYEES Click here to View Pictures of this Event. Principal Sheikh Zayed Medical College / Hospital Prof. Dr. Muhammad Saeed inaugurated Parking area reserved for motor cycle for SZMC/H employees , Dr. Capt. Mustaq Ahmad Medical Superintendent SZH, Chairman & President EWA Rana Muhammad Qasim, Muhammad Aslam were also present at this occasion . Sheikh Zayed Medical College and Hospital Employees paid special thanks to Principal Prof. Dr. Muhammad Saeed on the provision of this facility. 30TH SEPTEMBER , 2011 DENGUE AWARENESS CAMPAIGN. Click here to View Pictures of this Event. 19TH SEPTEMBER , 2011 ANTI DENGUE MOVEMENT AT SZMC/HOSPITAL Click here to View Pictures of this Event. The department of Community Medicine SZMC/H has decided to start “Anti Dengue movement” under the vision of the Principal SZMC/H Prof. Dr. Muhammad Saeed. Regarding this, department has decided to visit colleges, schools and start movement against dengue fever highlighting its clinical symptoms and role of students in its preventions. As a first step anti dengue movement has been launched the first team went to NICAS group of Colleges (girls campus) headed by dr. Abdul Razzaq Assistant Professor Community Medicine Department along with four demonstrator Dr. Mustafa, Dr. Samina, Dr. Rehan, Dr. Sehar, the speakers during their lectures highlighted the role of females in control breading sites of Aides Mosquito in homes. Students were motivated to make it a mission and join hands with government and doctors’ community for prevention of dengue fever. By the grace of Almighty Allah, The Journal of Sheikh Zayed Medical College (JSZMC) in recognized by PM&DC and included in Index Pakistan. This Landmark achievement from Sheikh Zayed Medical College is a symbol of recognition from the highest medical statutory regulatory authority, of the efforts of the Editorial, advisory board, staff of JSZMC and above all the vision, academic excellence of the honorable Principal, SZMC / H Prof. Dr. Muhammad Saeed. This milestone is a matter of honor to not only the faculty of SZMC but to the academic society of Rahim Yar Khan and the region that is Southern Punjab and upper Sindh. Sheikh Zayed Medical College/Hospital has organized a medical team comprising of Physicians, Surgeons, gynecologist and Paramedical Staff, for the treatment of flood-hit population in district Mir Pur Khas Sindh. This medical team with all essential medicines and ambulances has been sent to the flood affected areas and start working from today day & night for serving ailing humanity in flood affected areas. The other medical teams are being managed to send within few days till the relief of flood victims. 8TH JUNE, 2011 2ND ARTS EXHIBITION IN SZMC Click here to View Pictures of this Event. 31ST MAY, 2011 INAUGURATION OF COMPUTER RESEARCH LAB IN LIBRARY Click here to View Pictures of this Event. A computer lab has been established by the Department of Education Govt. of the Punjab in Library Sheikh Zayed Medical College /Hospital Rahim Yar Khan. Prof. Dr. Muhammad Saeed Principal of the Medical College has expressed his gratitude’s and Thanks on the eve of inauguration of the lab. The inauguration was attended by Prof. Dr. Abdul Kareem vice Principal, Prof. Dr. Athar Maqbool Chairman Library Committee, Prof Dr. Hassan Mahmood Tabasum, Prof Dr. Ghulam Sabir, Assistant Prof Dr. Muhammad Sharif, Librarian Fayyaz Mehmood Khan and All library staff. One AC donated by Prof Dr. Gulam Sabir Eye specialist and other one donated by Prof. Dr. Hassan Mahmood Tabasum and Dr. Saeed Malik have a very kindly donated the ACs for the library. Principal thanked the donors. Principal has expressed the library lab will be used by Faculty Members in a befitting for up to dating profession education as well as research in the relevant fields. 28TH MAY, 2011 SHIFTING OF PCR LAB. TO NEWLY BUILT PCR BUILDING Click here to View Pictures of this Event. PCR Lab. of Pathology Department had been working temporarily in second phase building of Sheikh Zayed Medical College/Hospital Rahim Yar Khan since December 2009. The complete functional PCR Lab. was shifted in newly purpose build PCR building adjacent to the previous location on 21-05-2011. The worthy Principal Prof. Dr. Muhammad Saeed of SZMC/H RYK inaugurated the shifting of PCR Lab. to the new building. Dr. (Capt) Mushtaq Ahmed Medical superintendent SZH, RYK, Prof. Dr. Abdul Kareem, HOD Pharmacology, Prof. Dr. Muhammad Abdul Rehman, HOD Pathology, Faculty of Pathology Department along with Demonstrators, Medical Officers and Medical Technologist were also there to witness the occasion. 26TH MAY, 2011 INSTALLATION OF MAGNETIC RESONANCE IMAGING (MRI) SUITE Click here to View Pictures of this Event. Magnetic Resonance imaging 1.5 Tesla machine ( Siemon – Germany) has been installed in Sheikh Zayed Hospital. This is one the latest machine in Pakistan. Its function is by magnetic field not by radiation and is safe regarding radiation hazards. Before this addition a number of patients had to travel to other distance cities. Now this latest facility is available at their door step. MRI is meant especially for diagnosis of soft tissues pathologies. It has high diagnostic value in Spine & Cord lesion, knee & shoulder joints. It is especially useful for delineation of soft tissue tumors and their extension & meta static evaluation. 23RD MAY, 2011 FUNCTIONING OF ANGIOGRAPHY CATHETERIZATION LABORATORY Click here to View Pictures of this Event. The state of art, Catheterization laboratory started functioning in March 11 by cardiology department in a newly build air conditioned building. The lab is equipped with Siements Artis Zee flour mounted flat panel system, which is a latest advent by SiemensGermany., It includes DSA, QCA, 3D vessel rebuild & quantification, latest Senses hemodynamic monitoring system including electrophysiology examination support. The machine can support angiographical examination, angioplasties, left and right heart catheterization. Permanent pacemaker insertion, electrophysiological examination and valvoplasties like PTMC. We have performed more than 350 procedures including coronary angiographies, angioplasties, and permanent pace maker insertion with no major complications, we have a well trained team capable of performance all mentioned procedures. On average we are performing five to six procedures daily. Coronary angioplasties, which most of our patients have been advised are not being performed routinely due to un-availability of stents. Very soon a cardiac surgical set up is being added which will address our 50 % of patient for whom coronary bypass operation has been advised. Sheik Zayed Medical College Rahim Yar Khan provides free of cost service to register new E-mail and its free access online. For example: your name@szmc.edu.pk. If any Teaching Staff Members and Students want to register his/her e-mail, then they can get print Performa from computer lab’s. Click here to download SZMC Email Requirements Performa . 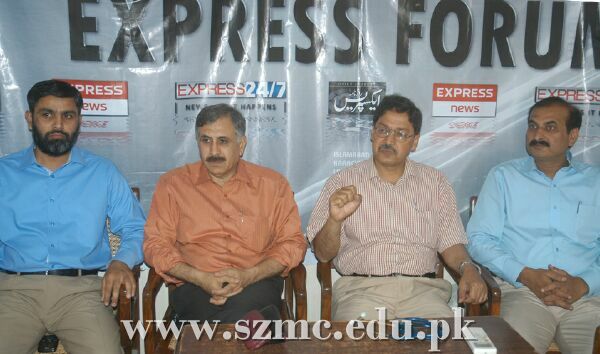 18TH MAY, 2011 SEMINAR ON HYPERTENSION IN SZMC Click here to View Pictures of this Event. Every year, May 17 is dedicated to World Hypertension Day. The theme is “Know Your Numbers and Target Your Blood Pressure”. On this occasion, a seminar presided by Principal Prof. Dr. Muhammad Saeed was held in college auditorium of Sheikh Zayed Medical College Rahim Yar Khan. Addressing the participants, renowned Professor of Cardiology Dr. M. Naeem Aslam said that purpose of this day is to promote public awareness about Hypertension and to encourage people to control & prevent this “Silent Killer”. High Blood Pressure is a major risk factor for the Stroke, Coronary heart diseases as well as kidney failure, he further added. Prof. Dr. Naeem advised the people to have medical regular checkup, learning more about B.P. and keeping it under control through regular course of medicine and making the plans for reducing the salty diets. Prof. Dr. Muhammad Saeed, Principal of SZMC said in his presidential address that lake of physical activity, mental pressure, obesity, excessive intake of spicy foods, smoking and consumption of alcohol are the major reasons leading to hypertension. He suggested that healthy lifestyle, balanced diet, proper exercise and less use of salt could save the people from the dangers of hypertension. 10TH MAY , 2011 VISIT OF CPSP Click here to View Pictures of this Event. A team from College of Physicians and Surgeons Pakistan, Karachi visited Pediatric surgery department on Friday 6th May, 2011. Two members from CPSP, Prof. Ghulam Asgher Channah, Registrar CPSP and Prof. Sikandar Mughal, councilor CPSP, visited Pediatric Surgery Department Sheikh Zayed Medical College Rahim Yar Khan, for accreditation of the department for FCPS part II training. The department of Pediatric Surgery consists of 35 beds, established under the kind supervision of Prof. Dr. Muhammad Saeed Principal Sheikh Zayed Medical College, Rahim Yar Khan and Prof. Dr. Muhammad Saleem Choudhary Head of Pediatric Surgery Department. After accreditation, FCPS training will be started in this department and this will be quite beneficial for doctors of Southern Punjab, Upper Sindh and Balochistan. Chairman BOM Ch. Muhammad Munir, along with Prof. Dr. Muhammad Saeed Principal Sheikh Zayed Medical College, visited H. H. Sheikh Khalifa Health Care Center, on 25th April, 2011. Dr. Muhammad Sharif Akhtar, along with Dr. Iffat Shad Soomro and Dr. Imran Bashir welcomed and briefed the honourable guests about working and facilities (OPD, Emergency, Laboratory, X-Ray, Ultrasound, Vaccination Center and Ambulance service for Emergency shift to Sheikh Zayed Hospital) of the H. H. Sheikh Khalifa Health Care Center. The honourable guests appreciated working H. H. Sheikh Khalifa Health Care Center. He also visited to H. H Sheikh Khalifa Allied Health Sciences for B.Sc. in M.L.T. O.T.T. M.I.T and Physiotherapy. On the Special advice of Principal Sheikh Zayed Medical College / Hospital Prof. Dr. Muhammad Saeed, New college canteen for girls students only has been opened in the lawn of Community Medicine Department where entry of boys students and other male customers is strictly prohibited. Isolated toilets for girl’s students are being constructed in this premises. College Principal ordered to maintain the high quality standard of canteen with price list control. VISIT OF SPECIALIST DOCTORS FROM SZMC/H TO THQ R. Y. KHAN FOR THE MONTH OF MAY 2011. APRIL 13TH , 2011 VISIT OF DCO AT H. H. SHEIKH KHALIFA HEALTH CARE CENTER Click here to View Pictures of this Event. It has been notified by the Prof. Dr. Muhammad Saeed Principal Sheikh Zayed Medical College, Rahim Yar Khan that all classes of M. B. B. S and B.Sc. Allied Health Sciences are being started again from 11th April , 2011. A workshop was conducted for FCPS & MCPS trainees at UHS Computer Lab Sheikh Zayed Medical College Rahim Yar Khan from 21-03-2011 to 25-03-2011 by “WHO Collaborating centre for research & Training in Educational Development of health personnel” and Development of Medical Education & National teacher training centre, College of Physician and Surgeon Pakistan. Twenty Five Doctors participated in the workshop. Mr. Shah Zeb Khan Assistant Manager I.T, from CPSP office Multan facilitated the Workshop. Participant appreciated the efforts of Mr. Shah Zeb Khan who made it sure that everyone gets hand on experience. All the participants & facilitator Mr. Shah Zeb Khan appreciated the high tech facilities available at UHS Lab. The efforts of Dr. Muhammad Sharif, Assistant Professor Community Medicine were also applauded for maintaining Computer Lab in Excellent condition. On the last day, Professor Abdul Karim, acting Principal Sheikh Zayed Medical College Rahim Yar Khan & Dr. Capt. Mushtaq Ahmad MS Sheikh Zayed Hospital Rahim Yar Khan Distributed Certificates to the participants. MARCH 24TH , 2011 AWARENESS WALK AND PUBLIC SEMINAR FOR TB CONTROL PROGRAM Click here to View Pictures of this Event. Early in the morning, distribution of 4000 Hand bills in newspapers. At 09:00 AM, an awareness walk lead by Professor DR. Muhammad Saeed, Principal Sheikh Zayed Medical College /Hospital Rahim Yar Khan started from Admin Block to College auditorium. It is attended by Prof. Abdul Karim, Vice Principal. M.S. DHO. EDO & large number of faculty members, Doctors, Paramedical Staff, Social Workers, Print & Electronic Media members & Public. Participants were holding banners & play cards displaying important messages for TB Control. At the end of walk, a public seminar was organized in the Auditorium of Sheikh Zayed Medical College Rahim Yar Khan. Professor DR. Muhammad Saeed, Principal Sheikh Zayed Medical College /Hospital Rahim Yar Khan presided over the seminar which was attended & large number of social workers, Doctors & members of Print & Electronic Media. Dr. Masood Ul Haq, Head department of pulmonology, Dr Abdus Salam Arshad,consultant chest physician, Dr. Ghulam Rabbani, DHO & District TB Co-ordination, Dr. Mushtaq Ahmed M.S Sheikh Zayed Hospital Rahim Yar Khan, Dr. Muhammad Jameel EDO Health & Prof. Dr. Muhammad Saeed Principal Sheikh Zayed Medical College / Hospital Rahim Yar Khan addressed the seminar. Speakers highlighted the important steps in control of TB. They stressed the participates & Print & Electronic Media to spread the message to everyone that TB is curable diseases, facilities for its diagnosis and treatment are available at all government hospitals free of cost and with co ordinate efforts, we can eliminate this disease from the world. The seminar was ended with the prayers for the success TB control program by Prof. Dr. Abdul Karim V. Principal. Fruit distribution for TB patients admitted in department of Pulmonology. Banners containing important messages for public were displayed at prominent places in city & hospital premises . 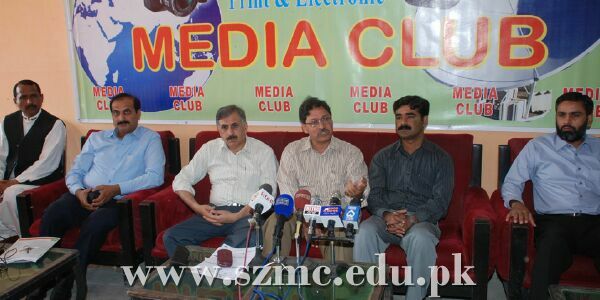 Number of Journalists from the local & national print media along with representatives of electronic media attended the press conference Dr. Masood Ul Haq, Assistant Professor & HOD Pulmonology Department along with Dr. Abdus Salam Arshad, Consultant Chest Physician & Dr. Imran Mehmood, Registrar spoke on the occasion & answered the questions of journalists. Important messages about TB & its control appeared on next days in print & electronic media. Mr. Naveed Kokhar, President Anti TB Association Rahim Yar Khan, Mr. Javid Mukhtar & Mr. Arshad Bajwa also present. Express forum arranged at office of Daily Express News Rahim Yar Khan. Salient features of Tuberculosis & its control were discussed by Dr. Masood Ul Haq & Dr. Abdus Salam Arshad. Proceedings of forum were published next day in Daily Express Newspaper, the most circulated newspaper in the area. VISIT OF SPECIALIST DOCTORS FROM SZMC/H TO THQ R. Y. KHAN FOR THE MONTH OF APRIL 2011. MARCH 10 TH , 2011 6TH ANNUAL SPORTS 2011 Click here to View Pictures of this Event. 6th Annual Sports 2011 of Sheikh Zayed Medical College Rahim Yar Khan held in Mehmood Stadium from 28th Feb. to 09th March. Final events of the sports celebrated on last day 9th March . Five colorful stalls of different classes with their slogans were presenting their identity . Principal SZMC Prof. Dr. Muhammad Saeed wellcomed the Chief guest Dr. Ahmed Javid Qazi DCO and other guests Dr. Sohail Habib Tajik DPO, Col. Farhat Nawaz (Rangers),Ch . M. Shafiq MPA . Ch. Muhammad Nawaz MPA. DCO Rahim Yar Khan announced,” Sports Opening “. All the viewers , students and teaching staff stood up in regard while unique “National Anthem” was played on violin. In his address, he said that games have very important role in healthy life and such activities should continue during the education. The players should have also sprit of competition. Medals were presented to the winners on the victory stand In the end, Principal Dr. Muhammad Saeed congratulated the sports committee who worked hard with full dedication. The UHS Lahore has announced the result of 3rd Professional MBBS Annual Examination 2010 ,Sheikh Zayed Medical College R. Y. khan, has been marvelous result and placed 2nd Position among thirteen Medical Colleges of the Punjab. The result percentage of SZMC is 91.58%. . Shirjeel Murtaza (783 marks), Nadia Illyas (764 marks) and Ilham Iqbal Sh. (753 marks) got 1st ,2nd and 3rd positions respectively in this college. We heartily congratulate to the respectable Principal, faculty of the college and the students. MARCH 6 TH , 2011 SZMC GOT 2ND POSITION IN 7TH ANNUAL FLOWER SHOW 2011. VISIT OF SPECIALIST DOCTORS FROM SZMC/H TO THQ R. Y. KHAN FOR THE MONTH OF MARCH 2011. FEBRUARY 22 ND , 2011 FIRST YEAR WELCOME PARTY Click here to View Pictures of this Event. Welcome Party of New Fist Year MBBS Class was held on 21-02-2011 on the lawns of Anatomy Department, Sheikh Zayed Medical College, Rahim Yar Khan. Students of 2nd Year MBBS arranged this colorful event with great enthusiasm and fervor. Stage was magnificently decorated. Different students of 2nd Year MBBS participated in skits to entertain the audience. Principle Prof. Dr. Muhammad Saeed took extraordinary interest in this celebration, his presence graced the occasion. At the end of program, Principle was invited on the stage. He appreciated the performance of students and cherished the efforts of Prof. Dr. Zafar H. Tanveer (Chairman Literary and Cultural Activities) for encouragement of the students in extra curricular activities. He also introduced different faculty members of the College and praised their academic results. For the first time in the history of Sheikh Zayed Medical College a fantastic opening ceremony was held in the badminton court Mehmood Stadium on 19th February,2011, at 8:30 P.M. Students of all classes participated whole heartedly and made this event cheerful & colorful. The opening match was played between our Honourable Principal Prof. Dr. Muhammad Saeed & Assistant Prof. Dr. Saeed Akhtar Malik. FEBRUARY 15 TH , 2011 EID MILAD-UN-NABI (SAWW) CELEBRATIONS. 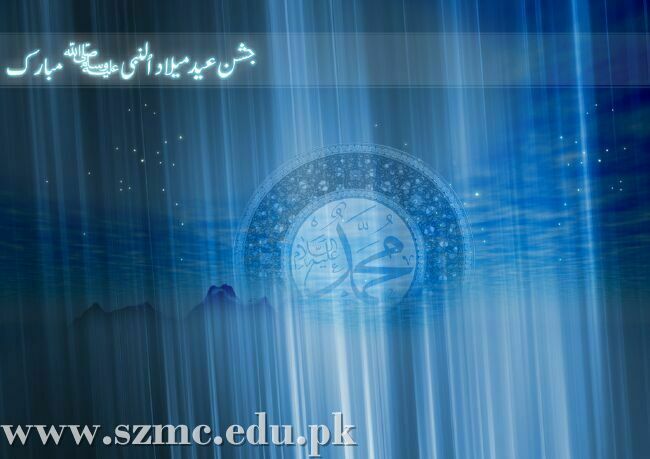 Eid Milad-un-Nabi (SAWW), and also said the Celebrating Eid Milad-un-Nabi (SAWW) with religious reverence and fervor renewing the pledge to follow true teachings of the Holy Prophet Hazrat Muhammad (SAWW). He also offered the special prayers for development, security , prosperity , & solidarity of the country, and safety, peace, unity and brotherhood amongst the followers of Holy Prophet (SAWW). FEBRUARY 12 TH , 2011 CONDOLENCE MEETING FOR DR. ABDUL KHALIQ Click here to View Pictures of this Event. Principal Sheikh Zayed Medical College Rahim Yar Khan Prof. Dr. Muhammad Saeed expressed his profound grief on the sudden demise of Dr. Abdul Khaliq while he was addressing to condolence meeting held in college auditorium. He announced that “Dr. Abdul Khaliq award” will be presented every year to first position holders in each subject of final professional exam. The other speakers who expressed their feelings on his sad demise were Dr. Niaz Ahmad Sidiqui, Dr. Anwar ul Haq, Dr. Akhter Saeed Malik and Prof. Abdul Aziz Javaid. During their address, they praised his immense work and whole life devoted for the ailing humanity. He was the renowned figure and respectable personality among the people of District Rahim Yar Khan due to his kindness and great services. Dr. Saeed Akhter Malik president PMA Rahim Yar Khan also announced“Life Achievement Award” for Dr. Abdul Khaliq on his unforgettable services in the medical field as first pioneer of PMA Rahim Yar Khan. In the end Doua was offered, “May Allah bestow the best of Jannah upon his departed soul and provide Sabar-e-Jamil his family members & friends to bear this eternal loss”. JANUARY 27 TH , 2011 SZMC R. Y. KHAN ORGANIZES ” CERTIFICATES /SHIELDS DISTRIBUTION CEREMONY “ Click here to View Pictures of this Event. A “Certificates / Shields distribution ceremony” was organized by the worthy Principal and faculty of Sheikh Zayed Medical College, Rahim Yar Khan on 25-01-2011, in the honour of 3rd Year MBBS students and teachers of 1st. Prof. MBBS class for achieving 1st Position among 20 medical colleges of Punjab (affiliated with U.H.S) in 1st Prof. (part-II) MBBS exam. 2009- 2010. Prof. Dr. Syed Muhammad Aijaz Ali (Head of Forensic Medicine Department) welcomed all the students, teachers and honorable guests. Hafiz Waseem (3rd Year) recited the Holy Quran and Nadish Afzal (3rd Year) said some verses in the honour of Holy Prophet (P.B.U.H). Distinction holders in the subject of Anatomy were awarded certificates by Prof. Dr. Nuzhat Perveen Khawaja (Head of Gynaecology Deptt. ), Prof. Dr. Abdul Karim (Head of Pharmacology Deptt. ), Prof. Dr. Abdul Rehman (Head of Pathology Deptt.) and Prof. Dr. Mukhtar Ahmed (Head of Biochemistry Deptt.). Prof. Dr. Zafar H. Tanveer and Prof. Dr. Athar Maqbool expressed their emotions and feelings about the function and the results. Position holder students were awarded Gold, Silver and Bronze medals by worthy Principal of Sheikh Zayed Medical College, Rahim Yar Khan, Prof. Dr. Muhammad Saeed. Then HOD’s of Anatomy, Physiology, Biochemistry and Islamiat / Pak. Studies were awarded shields and gifts by worthy Principal, SZMC, R. Y. K. Dr. Makhdoom Basharat Hussain (D.O.H) presented a gift to worthy Principal, from 3rd Year MBBS class for paying thanks to organize such a memorable function. Lastly worthy Principal, SZMC, R. Y .K expressed his views and congratulated the whole class and teachers. He also praised Prof. Dr. Syed Muhammad Aijaz Ali and his department for arranging such a nice function. The UHS Lahore has announced the result of First Prof M. B .B. S part 2nd Annual, 2010.Sheikh Zayed Medical College, has been marvelous result and placed first Position among Twenty Medical Colleges of the Punjab. The result percentage of SZMC is 90.57%. Ten students have obtained distinction in the subject of Anatomy and four in Physiology. Miss Hafza Syed and Miss Rahat Bano Siddiqui, both have been placed in 1st position in their class. Mr. Adil Mohyudinplaced on 2nd position and Mr. Muhammad Mannan has placed in 3rd position. We heartily congratulate to the respectable faculty of the college and the students. JANUARY 4 TH , 2011 SHEIKH ZAYED MEDICAL COLLEGE R. Y. KHAN WELCOMES THE 1ST YEAR MBBS BATCH FOR THE YEAR 2010-11 Click here to View Pictures of this Event. SZMC R. Y. Khan welcomed MBBS batch 2010-11 on the January 4th 2011 in Auditorium of the College. The welcomed address was given by the Prof. Dr. Muhammad Saeed, Principal, SZMC/H. Principal SZMC then gave a message preparing the students for the MBBS course ,He also said ” I must extend my heartiest congratulations to all those who have worked diligently and remained committed to the development of this institution.